In 1969, the leftist activist movement Students for a Democratic Society was falling into ruin. Some factions turned to terrorism; some distanced themselves from the bomb throwers; other went silent out of fear or disaffection. So you can understand why a playwright would find the death of SDS an appropriate topic for a modern tragedy. Steven Levenson’s shaky Days of Rage treats the drama in microcosm, focusing on one tiny commune of believers who start turning the movement’s own ideals against one another. Unfortunately, the idea is better than its execution: The play quickly gets repetitive, and Levenson’s work lacks both period specificity and an ending. A perfect staging might paper over the gaps, but director Trip Cullman largely miscasts it and, fatally for a play so stuffed with attraction and romance, delivers a production without a particle of sexual heat. 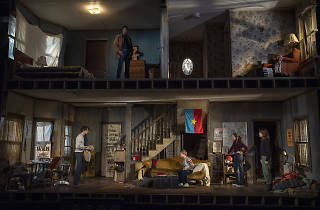 The play takes place in Ithaca, New York, where activists Jenny (Lauren Patten), Spence (Mike Faist) and Quinn (Odessa Young) live in a loose collective—which mainly seems to mean that Spence gets to sleep with both women. In the fraught run-up to the titular SDS protest in Chicago, Jenny starts dating the level-headed Hal (a nicely understated J. Alphonse Nicholson), and weird new recruit Peggy (Tavi Gevinson) moves into the house. Both interlopers, the sober straight-man and the dizzy extremist, tear the group apart. 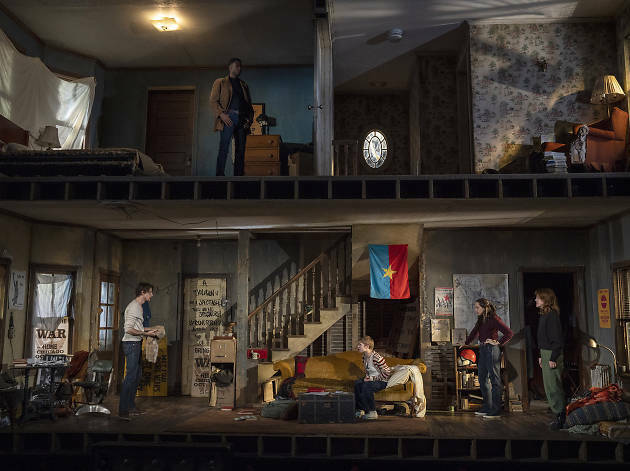 Louisa Thompson’s set, a rotting two-story house stuffed with revolutionary literature and dirty laundry, is thick with interest, but few of the actors seem to actually be living in her meticulously created world. They don’t feel the cold, except when there’s a specific line about the chill; they shout to each other when they’re just feet apart. In working with his actors—some of whom aren’t experienced in realistic stage portraiture—Cullman has spent too little effort on behaviors and textures, and the result is a thin, sometimes even amateurish, performance. Levenson’s play is difficult to watch. Provocatively, it is utterly cynical: There’s nothing truly communal happening in this house, nothing brave, no sense of comradeship and true purpose. The best you can say of the radicals is that they’re ineffective. This brutality might be acerbic and even thrilling; anti-nostalgia can be a bracing wind. But the details of the play are so unconvincing and the characters’ choices so baffling that we can’t believe they’re realistically sitting on the couch, let alone showing us the true face of progressive hypocrisy. Still, Levenson’s gift (from Seven Minutes in Heaven to Dear Evan Hansen) has always lain in imagining lonely people with hearts a little too sensitive for the rough world, and that particular talent has not deserted him. He has made a wonderful character in Jenny—she has a dozen reasons to leave the movement, and it’s moving to see how much it costs her to hang on—and Patten is tremendous. There’s no vanity in her, no sense of the actor behind the character’s face. In her frank performance, there lies the seed of another, better play. Second Stage Theater (Off Broadway). By Steven Levenson. Directed by Trip Cullman. With ensemble cast. Running time: 1hr 30mins. No intermission.